After I deglamorized good ideas, I started thinking about other topics to dissect. Content quality quickly came to mind. So, for a change, this post is not about creating content. 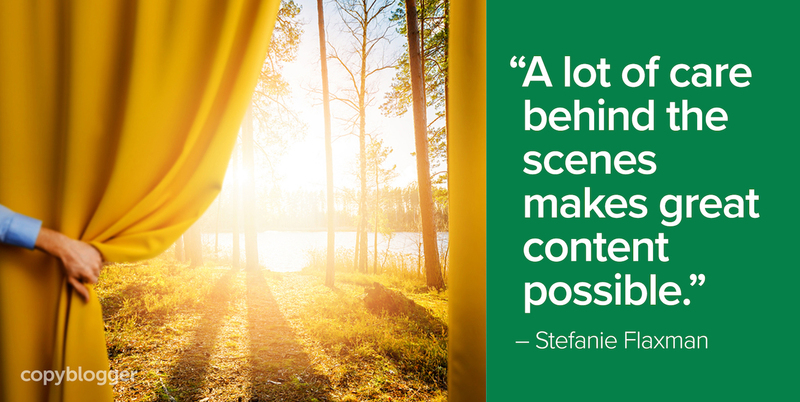 It’s about all the care behind the scenes that makes great content possible. Let’s look at 12 important steps meticulous bloggers consistently follow when they produce high-quality work. I always advise that this is the first thing you should do when you select a “New Post” in WordPress or any other publishing platform. If you start writing or editing your content while “Publish: Immediately” remains as the status of your post, you run the risk of publishing your draft prematurely by accident when you save your work. Everyone who’s made this mistake because they didn’t listen to me when I gave this direction knows I’m not being dramatic: It happens and it’s regrettable. I call this the Copyblogger Triple-Check — it’s a staple in this publishing checklist. Give your subheadlines the Copyblogger Triple-Check as well. When you’ve spent a lot of time editing your content, it’s easy to overlook mistakes in your subheads because you’re so familiar with what they’re supposed to say. Finding a typo in your content’s URL is just disappointing. And it’s completely avoidable if you also give your permalink the Copyblogger Triple-Check before you publish. More of my favorite proofreading pointers are here, and I’ll be sharing additional proofreading tips next week on the blog. If you’re the only person who writes for your blog, don’t skip over this step. Are your by-lines personalized with your name and author bio? Include those details so new readers can find out more about you. If you manage a multi-author blog, make sure you’ve selected the correct author and that their bio is current. No one wants an email from a reader alerting them that a hyperlink in one of their posts doesn’t work or goes to the wrong website. Even if you’ve carefully selected your hyperlinks, review your post in the Preview screen and click on all of them one last time. They look innocent, but quotation marks can be frustrating little critters for web publishers. If a hyperlink isn’t working properly when you test it, the quotation marks in your html might not be plain text. Locate those curly-Q-style quotation marks in your Post Editor, delete them, retype them, and you should be good to go. Categories help organize your content and make it easy for readers to find more information on a topic. For example, I like directing people to our Editing category on Copyblogger if they are interested in learning more about content editing. Assign the right categories to your content or create a new one if you’re exploring a fresh subject. You might need to add a “more” tag to your blog post. This tag determines which text will show on your blog’s home page, if your full post doesn’t appear there. The “more” tag inserts a link readers can click on to view the rest of your post. If that isn’t part of your publishing process, use this as a “wildcard” step — create a custom item that is necessary to ensure your content looks correct on your site. Featured images aren’t just for your blog. Get them set in the right spots on your publishing platform, so the correct ones show up on social media when you share your content and when other people share your content. Your meta title and description display on search engine results and social media. Attract the right readers with intriguing blurbs. Have you posted a comment policy for your community? Whether comments are always enabled, or if you turn them on/off depending on the piece of content, get your comment section ready to roll the way you want. If you like guidelines and best practices, you might like something new we’ve cooked up. We created a small but mighty resource to help you click Publish with confidence. It’s a framework that lets you check off the most important elements of good content, so you know you’re producing your best work. Because even when we know what to do, we have to remember to do it … every time. Get the Content Confidence Checklist, a simple resource that helps you publish quality content — each and every week. They may be a bit more complicated than the points you suggest, but I think they matter a lot too. Whenever possible, get someone to read it before you post it. It takes some $$, but having folks proofread my posts is money in my pocket down the road. Since I have a proofing company, I (literally) cannot afford mistakes!